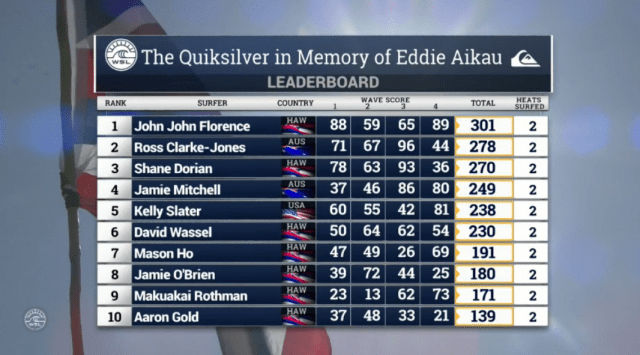 Surfers from the country of Hawaii dominated the leaderboard Thursday in The Quiksilver in Memory of Eddie Aikau. The big-wave surf invitational drew thousands of spectators to Waimea Bay on Oahu’s North Shore. For casual observers, many of whom were watching a surf contest for the first time, some eyebrows were raised at how the leaderboard explains where each surfer comes from. Under the category “Country,” six of the top 10 were from Hawaii, one was from the United States, two were from Australia and one was from South Africa. In recent years, there’s been a heightened awareness of issues important to Native Hawaiians, including sovereignty, making the leaderboard’s listing of Hawaii as its own country all the more salient. Kawabunga!! I’m so happy I could pee in the US pool.